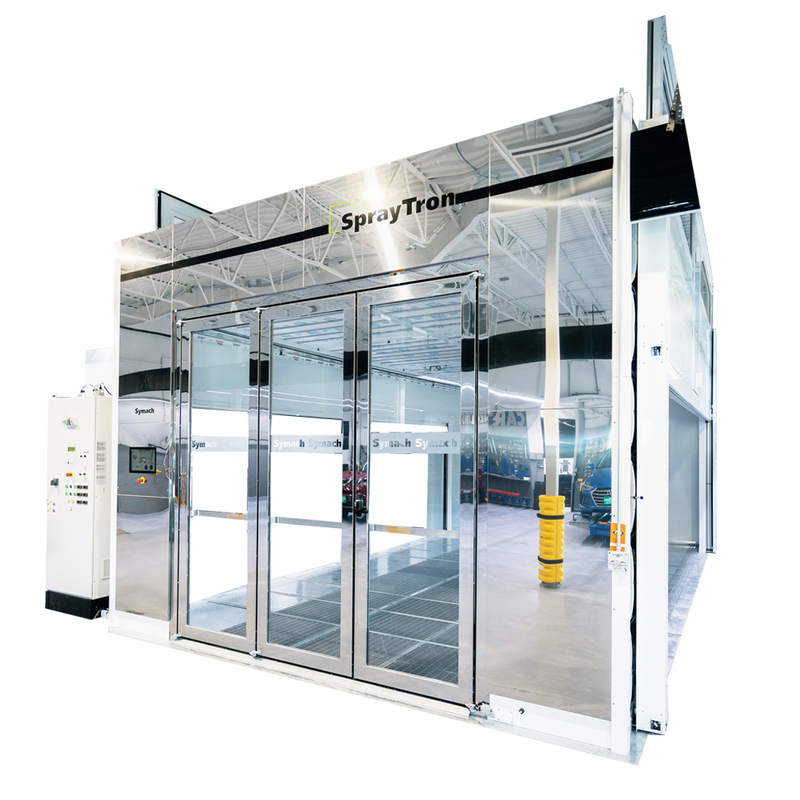 The SprayTron is the newest generation of spray booths on the market to date. It is high-performing, automated and it is built with the best burner, the best fans and the best material available on the market. It can work as a conventional spray booth using hot air from the burner or with radiant waves using a robot. 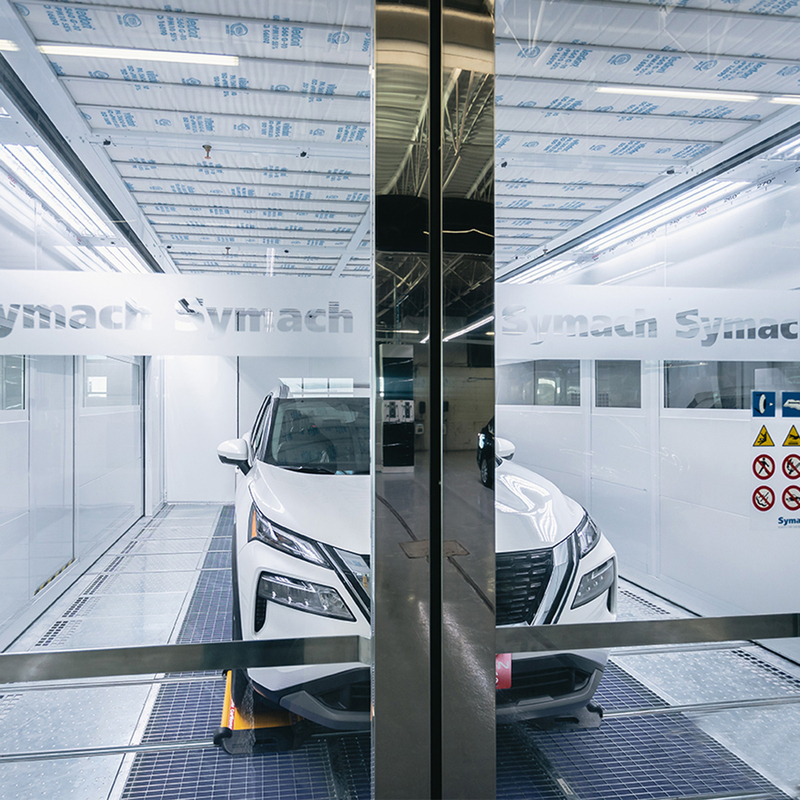 Since Symach doesn’t compete in the general spray booth market, the company set out to produce the best paint booth in the world: SprayTron. It is constructed out of the most high-quality components available, the fans are from the German manufacturer Ziehl-Abegg, a worldwide leader for fans, the burner is manufactured by NA Maxon-Honeywell and all electromechanical components are from Siemens. SprayTron can be used in a conventional way using a direct flame burner producing hot air reaching 60°C or 140°F in five minutes measured on the vehicle body or by using the Symach robot. The ventilation consists of a backward impeller fan of 34.000 cubic meters per hour or 20,000 CFM for a performance of air speed inside the booth of a maximum of 0,4 meters per second or 1.3 feet per second. This offers fantastic abatement of overspray. The floor is designed with four different chambers unique to Symach. 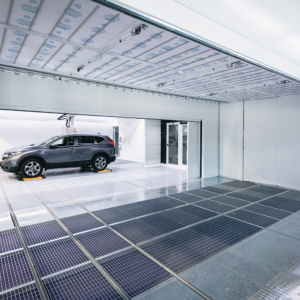 This guarantees a perfect, consistent and balanced airflow even when the floor filters are in need of replacement due to excess overspray or build-up. 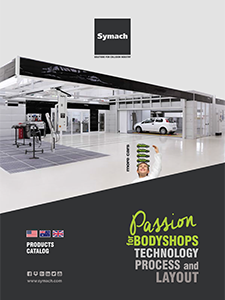 The SprayTron uses PowerLight – an innovative lamp developed by Symach’s research and development department. This product delivers superior lighting performance. PowerLight has a new and exclusive reflector that focuses the light beam with an angle and covers the vehicle from the roof to the vertical bottom side without any dispersion. The new light delivers quality and power superior to other lights on the market, both on the vertical and horizontal sides of the vehicle. PowerLight lights are also critical in the painting area. 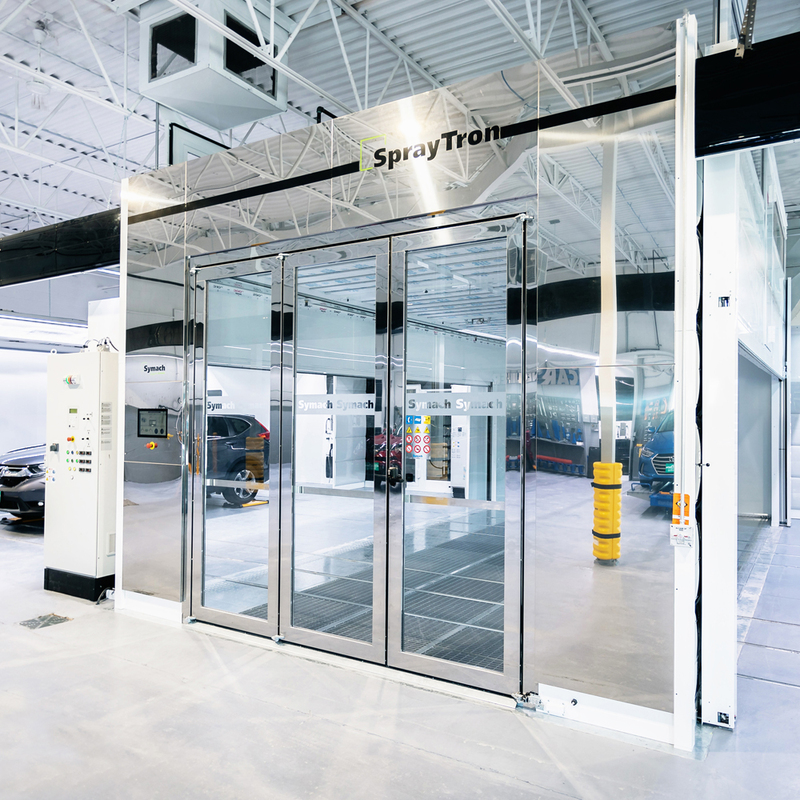 The SprayTron recognizes the different operations performed in the booth and automatically changes the program using the maximum speed of ventilation for the spraying phases and the average speed for drying. Both use a conventional burner or robot and the minimum air speed for climatization during the masking and cleaning phases. 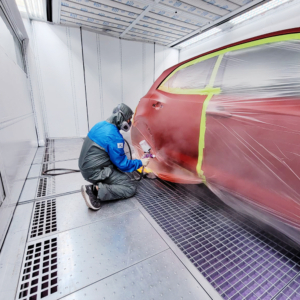 Using this product, the painter never has to push any buttons. The SprayTron can be configured with or without two pneumatic side doors. It is available in lengths of 8 meters (26.24 feet) or 9 meters (29.52 feet), and in heights of 2,7 meters (8.85 feet) or 3,2 meters (10.49 feet). 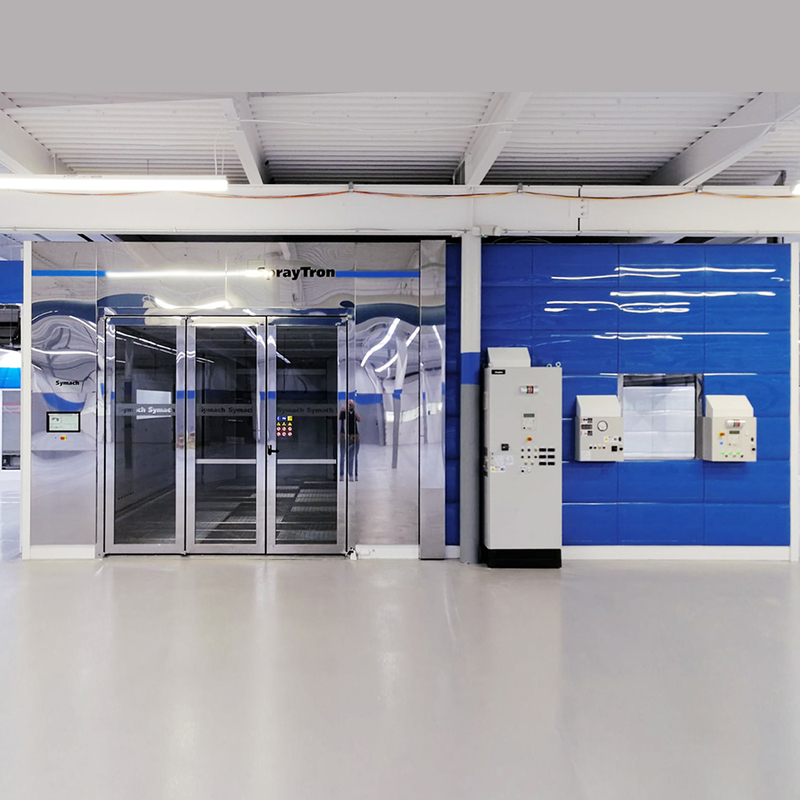 The front doors are constructed of glass, offering good visibility to the painter inside and out and the external cover is in CoverTop, ABS plastic panels, available in eight different colors. 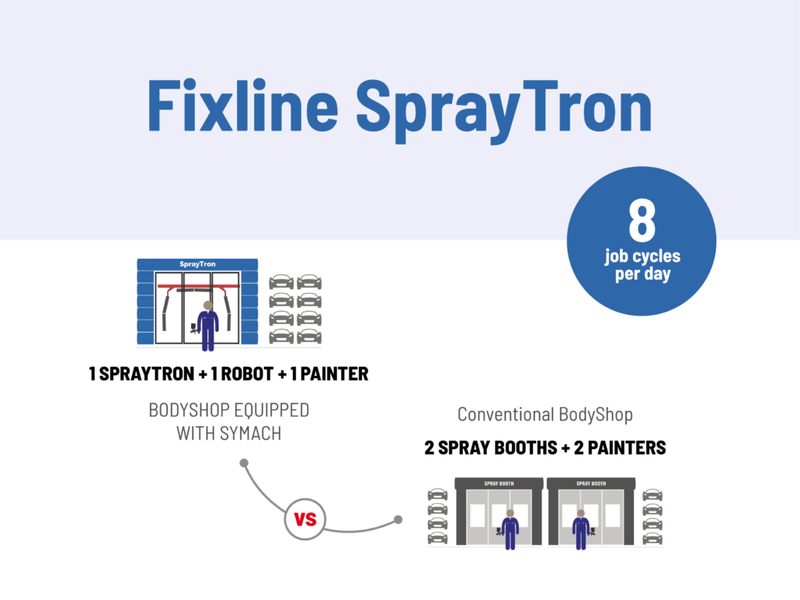 In new FixLine projects, Symach typically installs a SprayTron with the robot to produce 8-10 paint cycles per day. 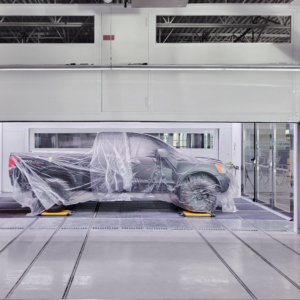 The SprayTron drying performance, without the robot, is of superior quality reaching 60°C or 140°F in five minutes measured on the vehicle. 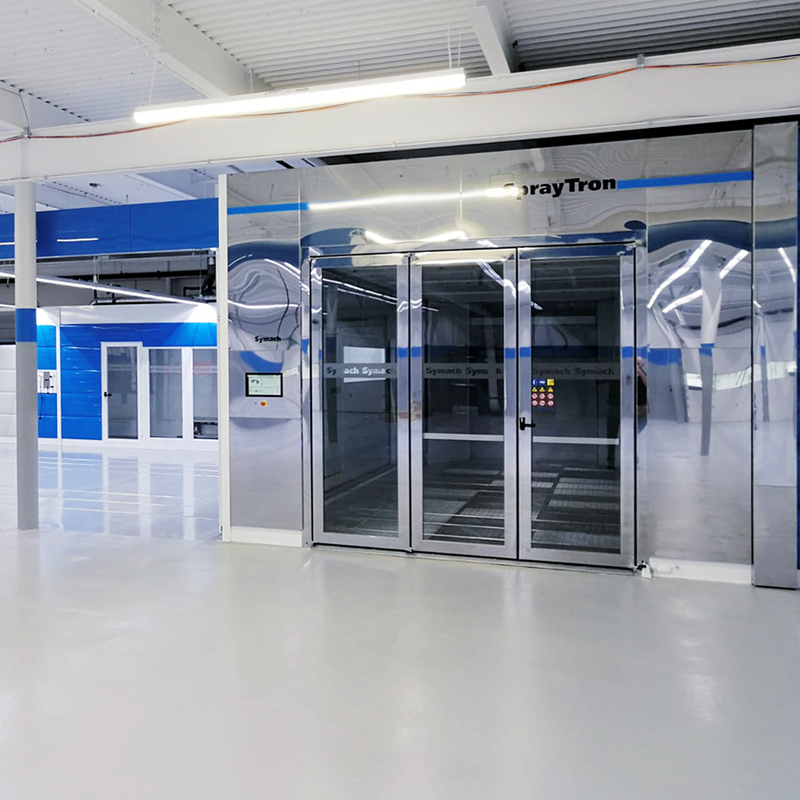 In special circumstances, SprayTron can also reach a temperature of 80°C or 176°F. > For the drying performance of the SprayTron using the Robot, please refer to the robot catalogs. The SprayTron computer automatically manages the four different programs without the operator selecting or pushing any buttons. It also automatically increases the speed of ventilation when the filters are dirty. 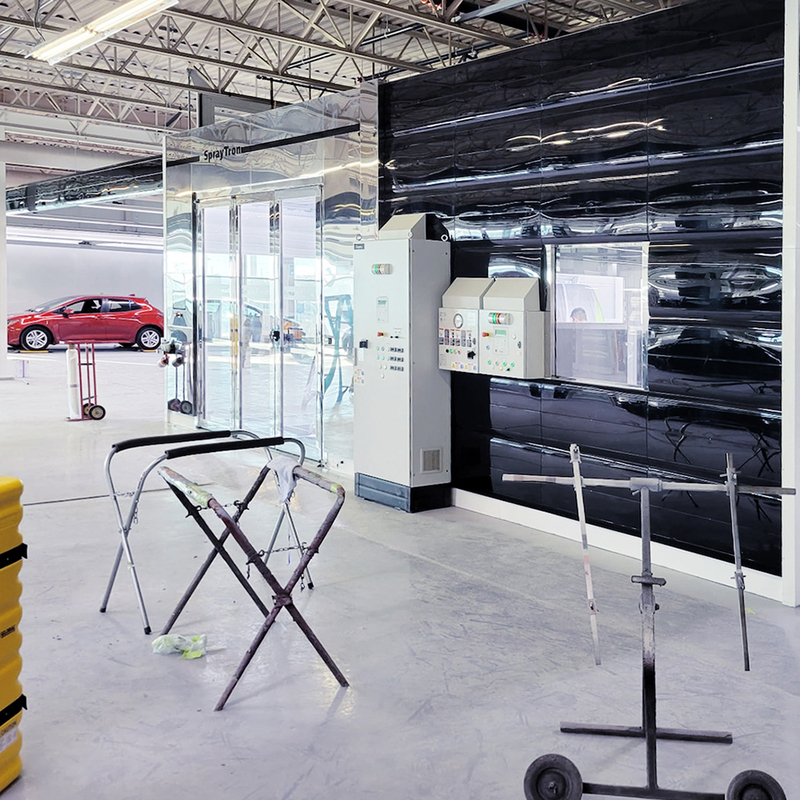 The programs: Spraying / This program uses 80% of the total ventilation and automatically starts when the painter uses the spray gun and automatically stops when the painter finishes spraying. 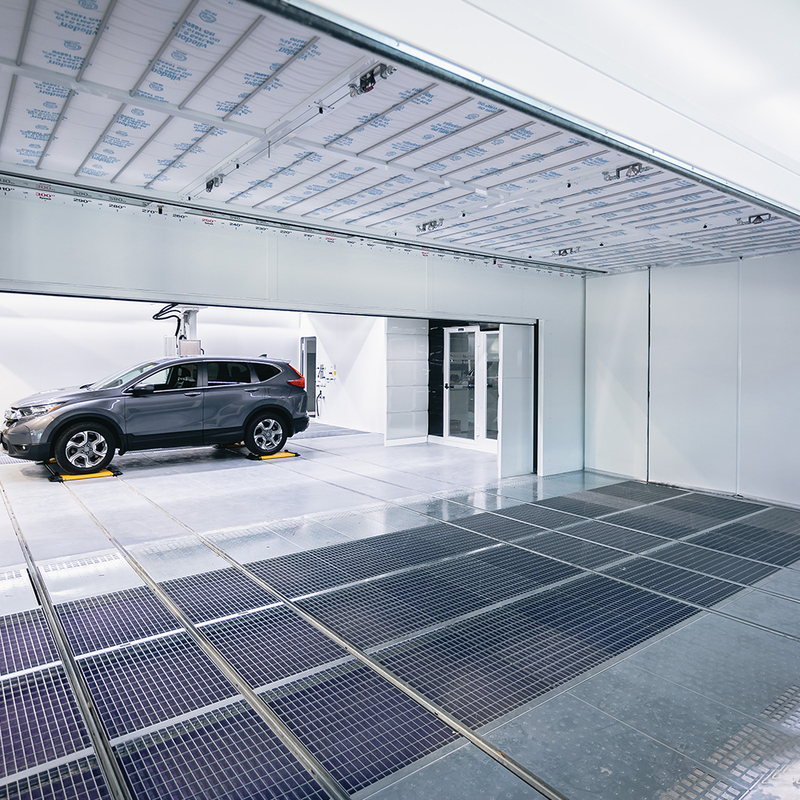 Drying with FlyDry robot / This program uses 40% of the total ventilation to remove the gas and solvent produced during drying treatment. Climatization / This program is available only in the version with inlet warm air. It uses 30% of the ventilation and starts automatically when one of the phases mentioned earlier ends. This program offers clean and warm air to the painter during the operation of preparing the car to be painted. • with a burner of 300 kW or 1,024,000 BTU/H. The SprayTron side panel is a tubular-welded frame. Inside the booth on the side, there is a metal sheet powder coating painted, in the middle there is 5 cm or 2 ” of insulation and on the external side there is the CoverTop ABS plastic panel available in eight different colors. The plenum is a tubular-welded frame to support the air ventilation channel and the filters, which are divided into six different boxes, are easy to open and change. The basement is 50 cm or 20 ” deep and the standard grids support a weight of 850 kg or 1,870 lb per point of 10 ” x 10 ”. Burner / The SprayTron can be set up with two different burners, both with direct flame of 210 kW and 350 kW. Ventilation group / The ventilation inlet and outlet have two backward impeller fans of 34.000 m3 per hour or 20,000 CFM, each one with two electric engines or 11 kW. The group of ventilation has two sets of pre-filter: the first one is for inlet and the second one is for outlet air. The SprayTron’s front door is divided into three parts with the total light in glass. 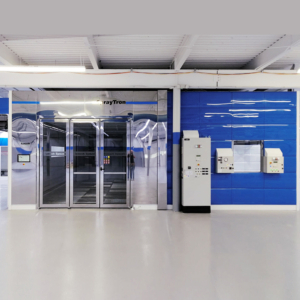 The side door opens and closes pneumatically and vertically to help avoid dust moving. 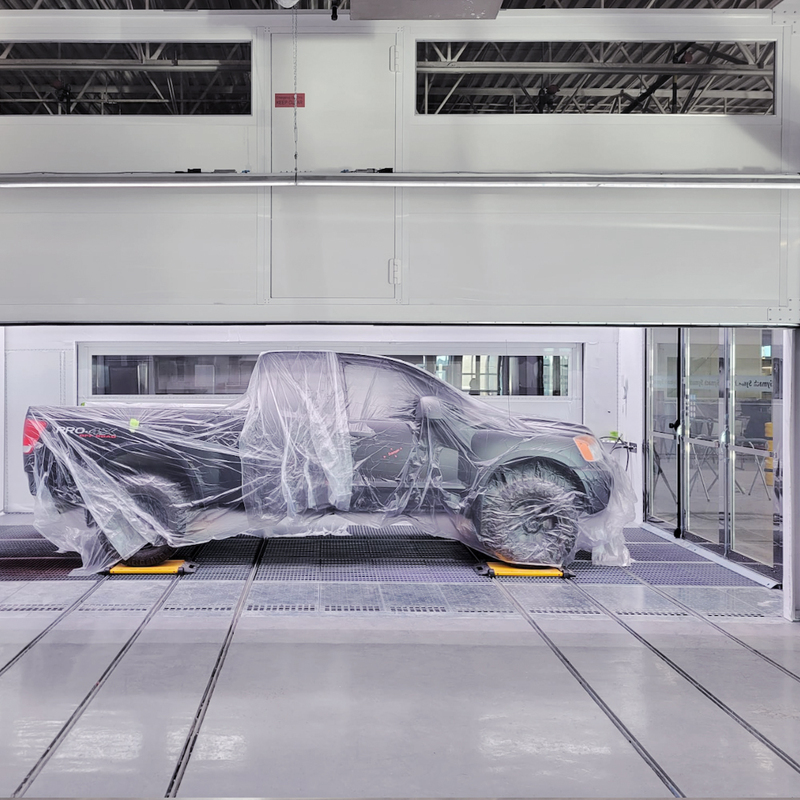 The outer covering of the SprayTron consists of CoverTop panels, made in ABS injection plastic mold. It can be opened and closed, which allows the installation of the electric or air compressed plant inside the SprayTron wall. 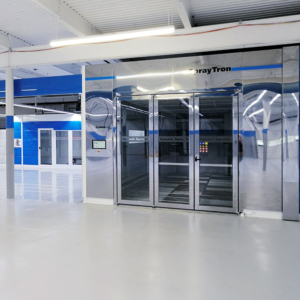 The SprayTron uses the light PowerLux, an innovative lamp developed by Symach’s research department that offers superior lighting performance. 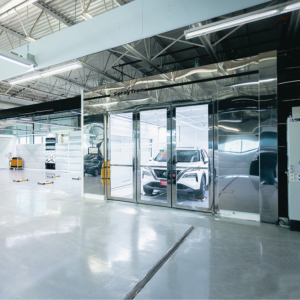 PowerLux has a new and exclusive reflector that focuses the light beam with an angle that covers the car from the roof to the vertical bottom side without any dispersion. This new light reaches a quality and power superior to other lights on the market, both on the vertical side of the car, as well as the horizontal side. This is very useful to the painter.